The Pilot Wire LoRa Remote is a LoRaWAN class C sensor that uses the mains voltage as a power supply. 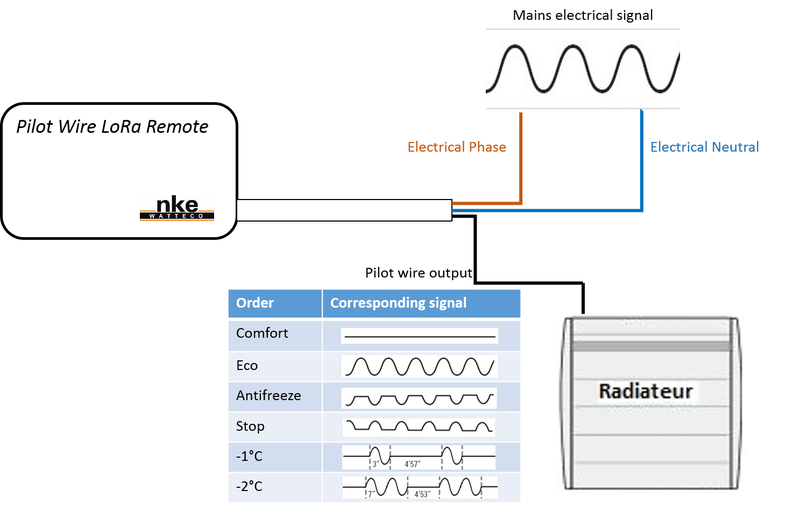 The Pilot Wire LoRa Remote can be used in two different ways: it can either control a radiator, or it can be used paired with a relay to control various On/Off devices. • The Pilot Wire LoRa Remote is connected to the mains power source, harmful voltage will be present on all wires during operation. • Connect or disconnect the device after MAKING SURE MAINS POWER HAS BEEN SWITCHED OFF FOR ALL WIRES (disconnecting a single wire, e.g. from a manual switch, is NOT sufficient). The Pilot Wire LoRa Remote is not waterproof. It must be protected from water spray and cannot be used in bathrooms. During the installation, the ground wire (Green/Yellow) must not be connected to the Pilot Wire LoRa Remote. However, it must be connected to the device that the sensor controls (a radiator, for example). Two fixing holes allow the device to be wall-mounted. It is strongly advised to use an electrically isolated screwdriver to attach the device. 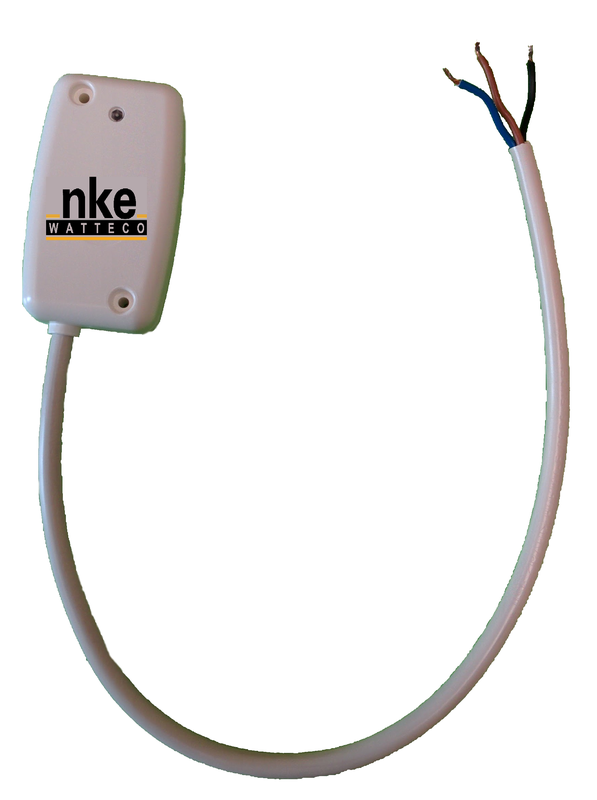 Use only electrical junction boxes that are in compliance with applicable electrical standards (NFC15-100). The Pilot Wire LoRa Remote has three wires: the brown wire has to be connected to the electrical phase, the blue one to the neutral, and the black one is the output of the pilot wire command. The mains is used as a power supply and as a signal generator for the pilot wire output. The Pilot Wire LoRa Remote cannot be directly used to operate as a relay. But it can be used paired with a relay. 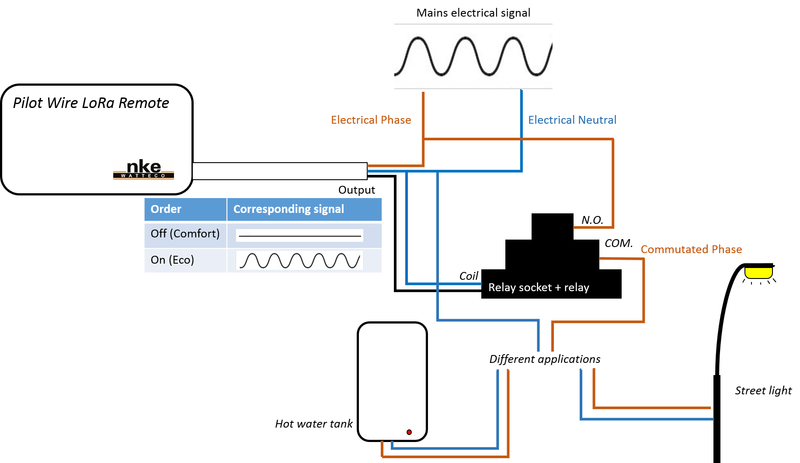 The relay is connected following the schematic below, in order to control various On/Off different devices (hot water tank, lamp, street light, etc.). The output signal will be used to control a relay that will be turned on if the command is the mains signal or off if there is no signal on the coil. The maximum current allowed will depend on the relay used. Moreover, a relay socket allows the relay to be placed inside an electrical panel. It is strongly advised not to put the sensor right behind the radiator that it controls, since a large piece of metal can alter the quality of the wireless signal. Red: blinking when AMR is activated. An AMR (Magnetic Switch) is available in the Pilot Wire LoRa Remote. 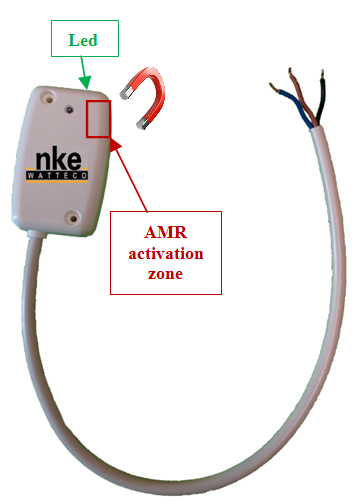 In order to activate it, a magnet has to be placed in close proximity to the AMR Activation Zone. When the AMR is activated, the red LED blinks very fast. This behaviour allows the user to easily know when the AMR is activated. A re-association procedure can be requested if no downlink frame is received by the sensor during a given periodicity (4 days by default) or if a given number (100 by default) is reached or in case of failure (no acknowledgement received) by sending an applicative frame to the sensor or via the sensor’s IHM. To ask the device to start a new association, pass the magnet 3 consecutive times near the AMR, the green LED will start flashing again. To reset the device, pass the magnet quickly twice then once for more than 7 seconds near the AMR, the orange LED will blink 3 times. To complete the “Factory Reset”, the device needs to be rebooted. The Pilot Wire LoRa Remote device implements “Multistate Output” cluster associated to the pilot wire output. Report the present value of the pilot wire output. The report has to be at least every 10 minutes, and a minimum time delay of 10 seconds must be set between 2 reports. → As there is only one pilot wire output, the EndPoint is 0, cluster “Multistate Output” is 0x0013 and attribute “PresentValue” is 0x0055. The maximum field has to be 0x800A to have a report every 10 minutes and the minimum field has to be 0x000A to have a minimum time delay of 10 seconds between two reports. The delta field has to be configured to 0x01 in order to trigger a report every time the pilot wire output changes. Timestamp and record the pilot wire output each time it changes. A report has to be sent at least every 24 hours. → As there is only one pilot wire output, the EndPoint is 0, cluster “Multistate Output” is 0x0013 and attribute “PresentValue” is 0x0055. The maximum field has to be 0x85A0 to have a report at least every 24 hours and the minimum field has to be 0x000A to have a minimum time delay of 10 seconds between two reports. There is just one value to record in the batch, the tag size can be 1 or 2 or 3. The tag size chosen here is 3. Label 0 will be used.